Yabloko sponsors have failed to persuade Grigory Yavlinsky that his party and the Union of Right-Wing Forces (SPS) should combine their candidate lists for the parliamentary elections. - It is difficult for the leaders of both the parties to find an acceptable coalition formula. YABLOKO's active voters remember only too well Gaidar's "shock therapy" and don't want to hear about the considered culprit Chubais. Tens of thousands of people across Russia have been left without central heating as temperatures in some regions drop to minus 40 degrees Celsius and even lower. The cold is also taking lives -- mostly those of homeless people who freeze to death outside. New link - the web-site of "The Charter of the New Democratic Coalition - the 20 Principle Platform for the Democratic Coalition" containing a broad-scale discussion of the draft platform for the democratic forces. As Gazeta have already reported before, today the idea of a coalition between the Union of Right-Wing Forces (SPS) and Yabloko can be forgotten.. Yesterday, on January 28, [Yabloko Leaders] Grigory Yavlinsky and Sergei Ivanenko forwarded to [SPS leaders] Boris Nemtsov and Irina Khakamada a letter, saying the SPS's proposals were unacceptable for Yabloko. The long-awaited meeting of the leaders of the two parties, scheduled for Wednesday, will not take place. YABLOKO will not merge with the Union of Right-Wing Forces (SPS) and will not form a joint list of candidates with the party in the run-up to the December 2003 parliamentary elections, the Deputy Head of YABLOKO faction in the State Duma, Sergey Ivanenko, said on Ekho Moskvy radio. After evaluating the prospects of the right of centre in the impending elections, liberals from the Yabloko Party announced that their leader Grigory Yavlinsky would not attend a Wednesday meeting with Boris Nemtsov. It looks as if Yabloko politicians believe they will get enough seats in the Duma, while the party of Chubais, Nemtsov and Khakamada will get none. The country's top liberal parties, Yabloko and the Union of Right Forces, or SPS, will not run together in upcoming parliamentary elections, an SPS leader said Wednesday. Developments over the past few months in Turkmenistan can only be termed political repressions aimed at oppressing the opponents of Saparamurat Niyazov and everybody who disagrees with the regime of Niyazov's personal power. as well as military aspects of American power were broached. The World Economic Forum in Davos launched "Fight for Trust". That is the wording used to describe the topic of the present meeting. The world political and business elite�perceives the situation around Iraq as�the main threat to stability. At present, there are two political forces in Russia: the Communist Party and Putin. Moreover, people seem not to perceive any fundamental difference between the two. Most people view them as representing their interests, aimed at improving their lives as soon as possible. People hope for a better standard of living and are becoming more indifferent to oligarchs, and believe in a stronger state. Everybody can forget the idea of a merger between Yabloko and the Union of Right-Wing Forces (SPS). Yabloko, led by Grigory Yavlinsky, has issued a firm "no" to an offer from the SPS, delivered via some business leaders. In other words, next week's meeting between Yavlinsky and SPS leader Boris Nemtsov, dedicated to the merger issue, will probably be pointless. Today it is possible to say that the major structural reforms announced by the Putin administration when it came to power would be postponed until Putin's next term in office. DAVOS, Switzerland -- A year ago the World Economic Forum, the annual gathering of the world's business and political elite, had moved to New York to show solidarity with the United States after the attacks of Sept. 11. This year, with the WEF back in Davos and the world a different place, the United States has been the target of attacks. Talks on a merger between Yabloko and the Union of Right-Wing Forces (SPS) have reached a crescendo. We have learned the gist of some carefully- concealed proposals for a compromise merger between the SPS and Yabloko. In brief, the unification plan consists of the following. In the Duma elections the two parties would form a single bloc, with a common list of candidates. YABLOKO�s deputies are fighting against corruption. Russian parliament members propose liquidating one of the "bureaucrats� pork barrel troughs - the Federal Service for Financial Rehabilitation and Bankruptcy (FSFRB). The Russian Democratic Party YABLOKO expresses its deep concern in view of the series of disasters in the housing and communal services sector in many regions of Russia. The leader of the Union of Right-Wing Forces (SPS) Boris Nemtsov confirmed that he had forwarded to the leader of YABLOKO Grigory Yavlinsky his proposals on a possible union between the two parties for participation in parliamentary and presidential elections. "Our proposals were forwarded to Yavlinsky via an influential intermediary," noted Boris Nemtsov in an interview with Interfax on Wednesday. Moscow, December 17, 2002. The YABLOKO faction supported the initiative of the centrist factions of the Duma to adjourn examination of the package of draft laws on the energy sector reforms from December 18, 2002, to a later period. "A Separate Body for Lobbyists Should Be Created." Such restrictions should not be abolished, otherwise the State Duma will be transformed into a banal shop for making money. Going into power a candidate, moreover a candidate from a one-mandate electoral district, should make a decision: either business or legislature. The fact that we in Russia cannot oppose deputies-lobbyists does not mean that we should eliminate the restrictions on business activity [for parliament members]. "Deputies do not have to be lawyers, but they should work as politicians, rather than businessmen." The erratic actions of deputy Semyonov (Ed. on allowing parliament members to engage in business at the same time) represents a strange and irresponsible PR action. He proposes a barbarian variant [of the draft law] that will lead to a complete merger of the authorities and the oligarchs. The present prohibition on entrepreneurial activity [for deputies of the State Duma] is feeble, but it is still a prohibition that blocks oligarchisation of the legislative authority. YABLOKO's amendment to the Tax Code approved by corresponding State Duma committee. The State Duma Committee for the Budget and Taxes approved the amendment of the deputies of the YABLOKO faction of the Duma Igor Artemyev, Sergei Ivanenko and Mikhail Zadornov into Chapter "Simplified Taxation System" of the Second Part of the Tax Code of the RF. Most of those polled by the Echo Moskvi radio station said that they would prefer to see Grigory Yavlinsky as a single candidate from the democratic forces [at presidential elections 2004], rather than Boris Nemtsov. Member of the YABLOKO party Alexander Shishlov headed the State Duma Committee for Education and Science in April 2002. At the time his appointment provoked varying reactions (some people held that this was almost an attack on education), but now we can state for sure: Alexander Vladimirovich is as worthy an advocate of the interests of the sector, as his predecessor Ivan Melnikov. Prime Minister Mikhail Kasyanov on Friday skipped a State Duma session where he was supposed to report on government measures to fix heating in the regions. A public inspection at the Zheleznogorsk mining-and-chemical complex in Krasnoyarsk Territory had positive changes. Let us remind you here that a commission headed by deputy from the YABLOKO faction Sergei Mitrokhin visited the complex in February, 2002. Now measures have been implemented to strengthen the security systems. The uncompleted shell of the RT-2 plant has been dismantled and a new concrete fence is being built. So the St Petersburg Legislative Assembly elections have taken place. By Sunday [8 December] evening it had been possible to clear the 20-per cent barrier established by new legislation. Voter turnout amounted to 29.4 per cent. Contrary to expectations, it was also possible to obtain the necessary number of voters in all districts. PARIS, Dec 10 (Reuters) - Imprisoned Russian journalist Grigory Pasko was named by French media watchdog Reporters Without Borders (RSF) on Tuesday as the winner of its 11th annual Fondation de France prize. 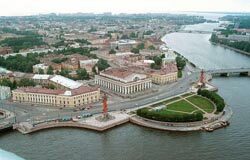 ST PETERSBURG, Russia, Dec 9 (Reuters) - An old adversary of Russian President Vladimir Putin appeared to have a good chance of gaining a third term as St Petersburg's governor after elections for a city assembly, his opponents conceded on Monday. Moscow and NATO have bonded over the past year, yet their true military relationship still stutters when the two Cold War foes try to do more than just talk, NATO-Russia experts here say. After concerted efforts by the government and the pro-Kremlin Duma majority, the much-disputed package of draft laws on reform of the nation's dilapidated and heavily subsidized housing and municipal utilities sector has eventually received the approval of the lower house. On Friday 244 deputies voted for the draft law, once again pledging unswerving allegiance to the Kremlin. The inflow of foreign capital into Russia may have an adverse impact on the country�s economy. This opinion was expressed by Deputy Chairman of the State Duma Budget and Tax Committee Mikhail Zadornov at a press conference today. According to Zadornov, as interest rates are low in the world and high in Russia, "foreign capital rates Russian assets as attractive." Deputy of the Duma Alexander Shishlov named "the politician of the year for education"
Moscow, January 11. 2003 (MK-Novosti). The results of the contest "Politician of the Year for Education" have been announced. Experts from "Uchitelskaya Gazeta" newspaper ("Teachers' Newspaper") called Chairman of the State Duma Committee for Education and Science Alexander Shishlov (the YABLOKO faction) "the politician of the year 2002". This information comes from the press-service of the YABLOKO faction. The competitors of Alexander Shishlov were Oleg Smolin, Valentina Matviyenko and even Vladimir Putin. How Free is the Man of the Year? In 2002 the Moscow News opened a new section. Each of its protagonists could have become President of Russia. Vladimir Putin became the President of Russia. Here are some excerpts from the Moscow News publications on the man of the year. The State Duma churned into action this week after its winter recess with lawmakers focusing on a major redistribution of powers among federal, regional and municipal authorities -- the centerpiece of the last session before this year's parliamentary race hits full stride. Russia--In the harshest winter in decades, more than 25,000 people across Russia spent the New Year and Orthodox Christmas in a deep chill after hot water pipes, built in the communist era and left unrepaired for years, froze up and then burst. Moscow, 10 January: State Duma Deputy Chairman Vladimir Lukin (the YABLOKO faction) and Communist leader Gennadi Zyuganov believe that a possible US attack on Iraq could have negative consequences for the Russian economy. Lukin said in an interview with Interfax that this military operation might have "negative, but temporary consequences" for the Russian economy. "Oil prices could sharply rise, but are then bound to fall again," he said. In any case, the oil price will stabilize at 22-28 dollars per barrel, which is acceptable to Russia, he said. Russia is holding parliamentary elections in 2003. Like the Olympics they are held every four years. The 1993 elections witnessed the collapse of Russia's Choice, the favourite at the time, and the victory of a "dark horse" - the LDPR. The authorities were shocked by the 1995 election results owing to the return of the Communist party as the leading force. The 1999 elections represented a breakthrough for the Unity party, which overshadowed the traditional success of the Communists. What will 2003 bring? The meeting of the Duma Council on January 14 clarified that the Duma would not consider the electricity sector reform package in the second reading on January 22. No final date for discussion of the package was set. As First Deputy Speaker Lyubov Sliska explained, this is simply a technical issue. At the moment, the government is preparing amendments to one of the laws included in the package. When they are submitted to the Duma, the ordinary council will determine the date for the debate. This decision is likely to be made on January 21, Sliska said; which means that the second reading will take place in February. The liberal Yabloko Party leader Grigory Yavlinsky, after consolidating support from his party activists at a conference held last Saturday, entered into a decisive battle Monday with the leadership of the Union of Righ-Wing Forces (SPS), long viewed by many as a potential ally of Yabloko in next year's parliamentary elections. Yavlinsky issued an ultimatum to SPS leaders Boris Nemtsov and Irina Khakamda, saying that to form an election coalition with Yabloko they must first expel Anatoly Chubais and Sergei Kiriyenko, whose political pasts undermine the reputation of the parties on the right. Endorsed by the Yabloko General Council last weekend, the charter is to be discussed by the Russian Democratic Assembly set up at the initiative of Grigori Yavlinsky's supporters. The charter comments sadly on the "declining confidence in democratic values and free market reforms" caused by "mistakes and sometimes crimes committed under the guise of democratic and reformist slogans by people calling themselves democrats and reformers." The charter concludes that "trust in the new alliance of democrats will be minimal if the coalition is headed by the same people who supported the war in Chechnya, carried out criminal privatization, built state financial pyramids, and initiated fiscal defaults." Speaking at his party's federal council on Saturday, Yabloko leader Grigory Yavlinsky hinted that if he was offered a post in Vladimir Putin's government, he would most likely accept it. 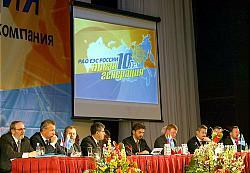 Furthermore, addressing the gathering convened to outline the party's election priorities for next year's parliamentary campaign, Yavlinsky pledged his full support for the Kremlin in all key areas of national development. The Kremlin's experiment aimed at creating a strong party system in Russia is doomed to failure. Ironically, Vladimir Putin's soaring ratings are to blame. This also means that the St. Petersburg liberals and top civil servants, who rose to power on the back of Putin's landslide election victory in 2000, will, sooner or later, have to go through the rigmarole of registering with the Justice Ministry, just like all other political parties. In less than a year Russia will have a new parliament and soon after, a newly elected president. The election marathon in this country is usually an exciting time. Recall Boris Yeltsin's first success in 1991 while Mikhail Gorbachev was still around and his narrow victory against Gennady Zyuganov in 1996 after lagging behind his rival for months. Recall Vladimir Zhirinovsky's unexpected triumph in the parliamentary elections of 1993 and the joint Communist-Agrarian victory in the Duma elections of 1995. Equally dramatic was the appearance out of nowhere of the Unity (Bear) party in 1999 which led to Putin's election as president and his eventual overwhelming control of the parliament. "Itogi" is repeated on Monday morning. I wanted to see if the interview had been shortened [in the Monday broadcast], as Yavlinsky spoke very sharply about the leaders of the Union of Right-Wing Forces (SPS), on criminal privatisation and electricity sector reform. Most importantly Kiselyov (anchor and author of "Itogi") conducted the poll among viewers in a live broadcast and obtained a result , which surprised him, was bad for the SPS and disastrous for Nemtsov. ST. PETERSBURG - Voters in St. Petersburg went to the polls Sunday to elect a new Legislative Assembly following a campaign marked by trickery and accusations of vote-buying. Efforts to break up the world's largest utility were dealt a fresh blow Tuesday as political and commercial interests collided to delay a key vote needed to clear the way for the government's most controversial restructuring project. Leaders of parliament on Monday refused to set a date to debate laws on a controversial electricity sector overhaul, raising concerns that the Kremlin's resolve to reform the lumbering power monopoly has crumbled.